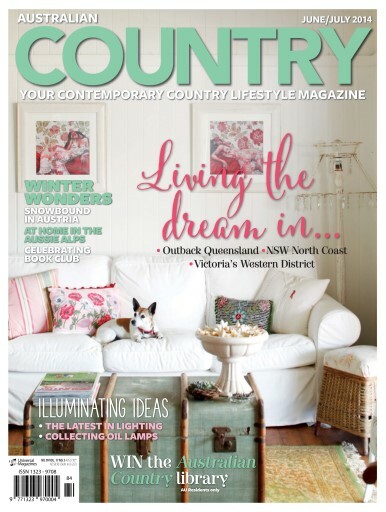 In this issue of Australian Country we’ve again scoured the country to find the most fascinating home and lifestyle stories for your reading pleasure. In Victoria we visit consummate collector Richie Rich at his Mornington Peninsula home and head to Ballarat where Haymes Paints marketing executive Kylea Wilson lives in considerable style with her husband, Grant, and their young family. Over in the West we catch up with Gail Gregson at her Perth Hills home and in South Australia, we meet Wendy and Phil Watson who run Birks Harbour and luxury waterside accommodation at Goolwa. 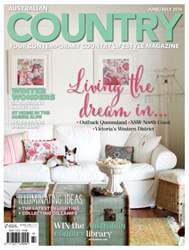 Our garden feature focuses on the extraordinary park-like expanses at Mayfield near Oberon and our travel feature casts the spotlight on the stunning landscapes of Queensland’s Carnarvon Gorge. Our chief cook Kay Francis celebrates the infinite variety of apples and stylist Sandra Hinton develops a story about a crafternoon with some of her knitting buddies.